Crusaders manager Stephen Baxter suffered a frustrating weekend at a Seaview venue set to host league leaders Coleraine tonight in the cup. Pic by PressEye Ltd.
Stephen Baxter’s Crusaders squads have managed a march to sustained success built on the foundation of the fundamentals. Consistency developed around the broad twin pillars of a collective work ethic and individual talent established the club as a modern Irish League force. Coleraine manager Oran Kearney. Pic by PressEye Ltd.
Crusaders boss Baxter maintains his faith in the Seaview squad but admits a desire to return to those building blocks following some unfamiliar and unwelcome traits across the opening stages of the season. A 3-2 home reverse to Glenavon last weekend featured a string of errors by a Crusaders side short of cohesion, with Baxter using the time period between that defeat and tonight’s League Cup visit by high-flying Coleraine as an opportunity to evaluate and analyse. “You cannot wallow in self-pity, it is a big boys’ league and we have another game now,” said Baxter. “It’s a little bit about consistency and a little bit about desire. “We think about everything, ask for more and drive them on for more, having been competing at a superb level for four years. Glenavon first-team coach Kris Lindsay. Pic by PressEye Ltd.
“But we have no divine right to win games, there are a lot of good teams. “You are trying to maintain levels but have to always earn the right to play. “I know the quality and work ethic here and I’ve so much belief in this group it is untrue. “Coleraine are playing on the frontfoot, working really hard as a unit and have the momentum. Coleraine’s rise to the top of the Danske Bank Premiership table has injected fresh life into a title race traditionally dominated by the established Belfast squads of Cliftonville, Crusaders and Linfield. Plaudits for the Bannsiders’ dynamic displays have often been delivered with the caveat of concern over an ability to mount a sustained league challenge with a squad short on numbers and trophy-winning experience. But Coleraine boss Oran Kearney is refusing to risk a disruption to momentum by prioritising games. “We want to do well in every competition,” said Kearney. 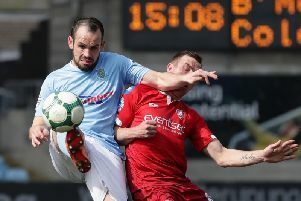 “The squad is being tested, we are without Eoin Bradley, Brad Lyons and Josh Carson for Tuesday. Ards welcome Glenavon for the first of two home games in four days - with Warrenpoint Town then hitting the road in a key battle for league points. “We have a big game in the League Cup on Tuesday and then a massive game on Friday night,” said Ards boss Colin Nixon. “We should have a full panel but I have plenty to think about. “It’s a big week for the club, we have two games in five days. Glenavon gained a significant away-day boost last weekend by beating Crusaders at Seaview in a thrilling league success. The combination of grace and game management left first-team coach Kris Lindsay delighted at the growing maturity of Glenavon’s young panel. Kick-off will be 7.45 in both ties.